The new Audi TT has a more horizontal appearance. Two contours form a V-pattern over the engine hood and the brand's four rings badge now sits centrally on the hood. 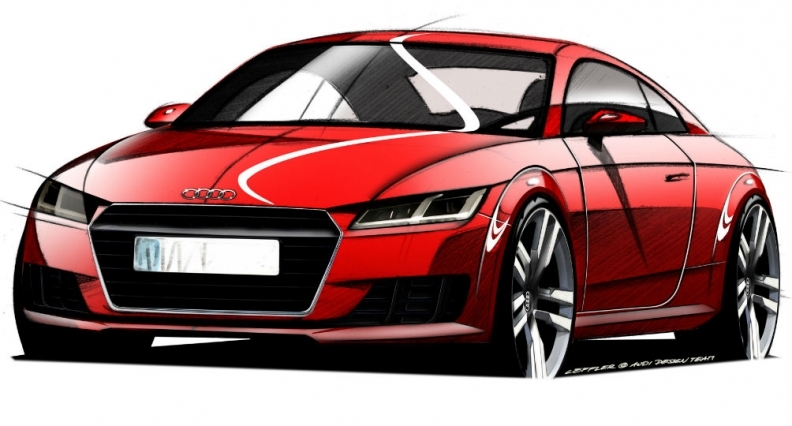 MUNICH -- Audi's new TT coupe will feature more angular styling that will give it a closer family resemblance to the mid-engine R8 supercar, a sketch unveiled today by the automaker shows. The latest TT, which will debut at next month's Geneva auto show, has a sharper and flatter front end while largely retaining the low, sleek appearance of the current and first-generation models. "The designers have reinterpreted a host of ideas from the first TT generation from 1998 in a dynamic, diverse way," Audi said in a statement. The TT will be offered with the brand's new Matrix LED technology, where controllable individual light-emitting diodes generate the main beam. Audi showed interior details of the TT including a 12.3-inch infotainment system that will replace the conventional dial cluster at the Consumer Electronics Show in Las Vegas in January. The TT coupe is set to go on sale toward the end of the year. A roadster version likely will be unveiled at the Paris auto show in October. Audi executives have hinted that the TT's coupe and roadster variants could be joined by a crossover version inspired by the Allroad Shooting Brake concept unveiled at the Detroit auto show in January.